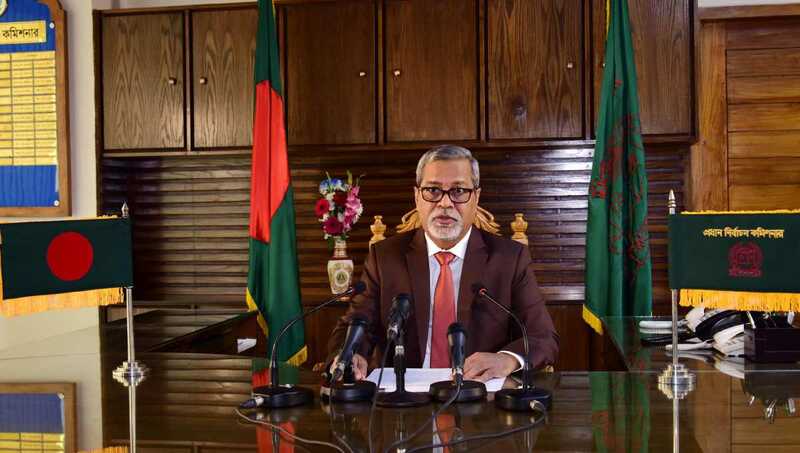 Photo: Chief Election Commissioner (CEC) KM Nurul Huda announces The 11th parliamentary elections date in a televised address to the nation on Thursday, November 2018. Dhaka, Nov 8 : The 11th parliamentary elections will be held on December 23 (Sunday) next,Chief Election Commissioner (CEC) KM Nurul Huda announced in a televised address to the nation on Thursday evening. He announced that the last date for submitting nomination papers is November 19 while the date for scrutinising nomination papers is November 22 and the last date for the withdrawal of nomination papers is November 29. “If there remains any disagreement and dispute among them, then I urge them to resolve those politically. I request everybody to demonstrate patience and respectful political behaviour to each other,” Nurul Huda said. He also expected a competitive election with the participation of all political parties. “In a competitive election, I believe, irregularities can be checked with the active participation of the supporters of candidates,” he added. Nurul Huda urged the political parties to remain alert so that competition never turns into revenge or violence. Law enforcement agencies will strictly be instructed to make sure that no voters, political leaders, activists, supporters or agentsface harassment or false cases, said Huda. Listing a number measures taken by the EC for holding the national election, the CEC said they have prepared the voter list and amended the relevant laws ahead of the election while a list has been published re-demarcating parliamentary constituencies. Besides, the voter list has been finalised, selection of 40,000 voting centerscompleted and the registration applications of 75 political parties have been disposed of, he said. Training programmes have been arranged for the first time for polling agents,the CEC said adding that the procurement of election materials and printing workshave been completed. Besides, the preliminary process of appointing 7 lakh officials for conducting the elections has been concluded, while 6 lakh members of law enforcement agencies including police, BGB, Rab, Coast Guard, VDF andAnsar will be deployed, Huda said adding that executive and judicial magistrates will be appointed in each constituency. Actions will be taken if they fail to perform their duty properly, he said. Armed forces will be deployed for assisting the civil administration to maintain the law and order. Nurul Huda said a spontaneous interest is visible among the people of all strata centering the polls and political parties have started taking preparations for the election while civil society members keep on expressing their opinions, he said adding that opinions, analyses and criticisms by election experts, political analysts are being published in mass media, while television channels are airing talks-shows on the election. Besides, he said, various local and foreign organisations have expressed their interest to monitor the elections. “A favorable atmosphere has been created across the country for holding the parliamentary elections. I hope all voters and candidates will abide by election rules and the code of conduct,” the CEC added. He said election officials will perform their duties neutrally, while executive magistrates will ensure enforcement the law, newspapers and media would publish news maintaining the objectivity. Election observers will perform their duties following the Election Commission’s rules, Huda said. “Importance has been given to the use of digital technology in the upcoming national election. The polling system-related software and programmes have been updated and modernised. There’s also a system of submission of nomination papers online,” he said. An initiative has been taken to use Electronic Voting Machine (EVM) along with traditional system of vote casting, the CEC said adding that the Election Commission has been successful in using EVM at several local-level elections. The qualitative standard of election will be ensured if the EVM could be used, which will also save time, money and laobour, he said.